. Easy to read led indicator., Easy intallation. Op. System：Windows 98SE/ME/2000/XP,Macintosh OS 9.0above. Support USBV1.1/2.0, both 10Mbps and 100Mbps network speed both in Half-Duplex and. Full-Duplex Transfer modes., IEEE802.3X flow control for Full-Duplex mode. If you want to make custom USB2.0 LAN Network card with your logo,slogan,telephone,website,email , please send us your design or give us instructions about your imprint.We'll send a free virtual art proof for your approval,you can ask a real sample with logo before production too. 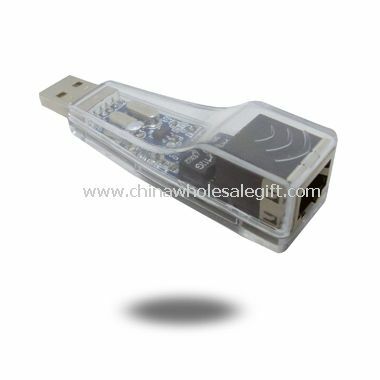 Our USB2.0 LAN Network card is popular as promotional,advertising, business,corporate gifts.